Here is the transcript of my talk tonight at Pepperdine University. Many thanks to Linda Polin for inviting me to speak to her students. When people ask me how I ended up becoming an education technology writer, I’m never quite sure how to answer. I don’t have a degree in “education” or “technology” or even “writing.” I sometimes joke that I took an aptitude test in junior high that gave me one career option — freelance writer — a result that, truth be told, caused me to panic a bit and dismiss the idea altogether. So there wasn’t really one moment when I decided this was what I was going to do, and there isn’t really a clear path that I can trace for you that got me to where I am today. Instead, there were lots of little episodes, things I didn’t always think deeply about at the time, that have shaped my views about education and technology and that have prompted me to ask, “Wait, what are we doing? Why?” and then to write about it online. In 1991, after two years of university back east, I dropped out of school. About a year later, I had a baby. I moved back to Wyoming, where I was born and my folks lived. I recognized that I would need to get a college degree, particularly if I ever wanted to “escape" my hometown again. But Wyoming only has one university, and it was 150 miles away from where I lived. I didn’t want to relocate, so instead I enrolled at the local community college that had just launched an outreach program in association with UW, offering a handful of bachelor’s degrees. The outreach program was geared towards what we sometimes call “non-traditional” or “adult” learners, so many of the classes were held in the evenings or on weekends. And as the community college hadn’t really built out a large faculty for teaching upper division classes, a number of our courses were offered via “distance education," with an instructor and classes in community college campuses across the state connected through the wonderful, cutting-edge technology of the conference call. We were also encouraged to take advantage of correspondence courses from other regional universities. I’d heard some not-too-nice things about the community college statistics instructor, so I decided to take Introduction to Statistics through a correspondence course. I received in the mail a giant box containing the textbook, the worksheets I needed to complete and return to the professor, and half a dozen or so videotapes containing all his lectures. I really had a hard time with the course. I know this experience colors my views on online education today, particularly when I hear that some combination of videos and exercises — whether it be Khan Academy or MOOCs — is going to make us all more adept at math and science and engineering. I just don’t believe that the ability to rewind or replay a video is that useful in helping a student struggling to understand a concept. Me, I rewound and replayed those statistics videos a lot. It didn’t help. But my experience with the correspondence course did help me understand, I think for the first time in my life as a student I think, how our models and our theories and our practices in education shape and are shaped by the technologies we use. Receiving this box of materials in the mail was a literalization of the idea that education involves “content delivery.” That is, the courseware for Intro to Statistics was quite literally delivered to my doorstep. I’d insert the videotapes into the VCR, and the content would be delivered to my living room and purportedly into my brain. “Content delivery” is not always quite so literally enacted, of course, but it’s still the paradigm education operates within. This is not a new paradigm, of course. But for me this was the moment — looking with frustration at this this box of videotapes — that I realized that that’s what education privileges. That model of thinking about teaching and learning and arranging courses and classrooms is incredibly old. And despite all of the hype and hoopla about new technologies disrupting old models of education, we see this fixation on knowledge acquisition becoming hard-coded into our practices in the latest ed-tech software — software that now promises to make the process more “personalized” and more efficient. That is, despite all the potential to do things differently with computers and with the Internet and with ubiquitous digital information, school still puts content in the center. Content, once delivered by or mediated through a teacher or a textbook, now is delivered via various computer technologies. One more story from my time at Casper College: In 1994, Congress passed the Violent Crime Control and Law Enforcement Act, the largest crime bill in the history of the US. It’s best known for its ban on assault weapons. But one “small" provision ended the ability for prison inmates to receive Pell Grants. 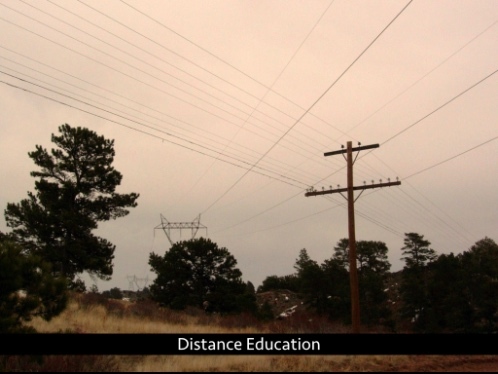 Prior to that, inmates did often pursue their degrees through distance education classes. I know, because thanks to distance education, I had classes with them. I still remember the first evening of my Political Violence course, as the professor asked all the students in the various remote campus locations to identify themselves. A couple from Riverton. A couple from Sheridan. One from Powell. And there were three students on the conference call from the Wyoming State Penitentiary. Three inmates. Three students. Let me tell you: our class discussions of terrorism, gun ownership, police violence, political activism, war, the legal system, and the death penalty were much, much richer for their presence. That’s an important shift in the model of education. The content — the assigned readings, the lectures, the videos — were not, could not possibly be, the center of that class. The content could not be “delivered,” because our analysis of political violence had to be constructed and deconstructed and negotiated, with full recognition of those who were in the class and had experienced, enacted forms of political violence — whether those students were in the pen or not. The class — connected through telephony — was networked, as in turn was the learning. Peer learning, networked learning — we talk a lot about these quite a bit in ed-tech today. We make some gestures to that end — the possibilities afforded to us, not so much by conference calls, but by newer forms of connectivity. By the Internet. But more often than not, we still lasso technology for the more traditional purposes and practices of education: for content delivery. We keep designing education technology with an emphasis on knowledge acquisition, despite all our glee about a move into an information age where our relationship to knowledge will supposedly be transformed. We are still designing ed-tech for the past and not for the present and certainly not for the future. 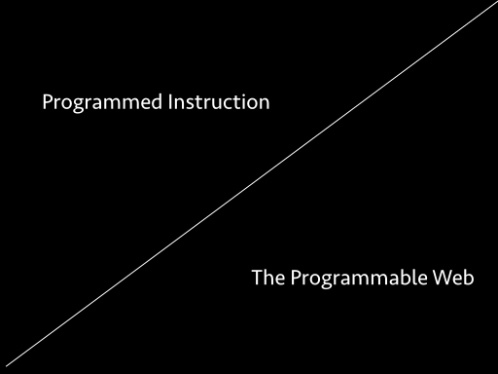 So these are the two models of ed-tech I want to talk about tonight: programmed instruction and the programmable web. I realize, of course, that I’m making an all-too-tidy divide — as though there are just two theories, two models, two visions, two technologies, two choices, two futures. And yes I’m using these phrases as shorthand, recognizing that they both have their own complex meanings and histories and pedagogies and ideologies and practices. But I firmly believe that these are histories and pedagogies and ideologies and practices that we in ed-tech need to pay much more attention to. Most education technology today, particularly that which is used in classrooms, would fall into the “programmed instruction” category. And frankly we shouldn’t be surprised by that. If you buy my premise that education has been and is focused on “content delivery” — you needn’t, of course — then an embrace of programmed instruction certainly makes sense. Programmed instruction is a technological intervention in that content delivery mechanism. As my experience with the Intro to Statistics videos underscores, programmed instruction pre-dates the Web. It pre-dates the computer. It is, I contend, the driving force behind the development of the field of education technology throughout most of the twentieth century. Here we can see the origins — the original aspirations, even — of ed-tech: the idea that some sort of mechanism could be developed to not only deliver content — that’s what Edison imagines — but to handle both instruction and assessment. 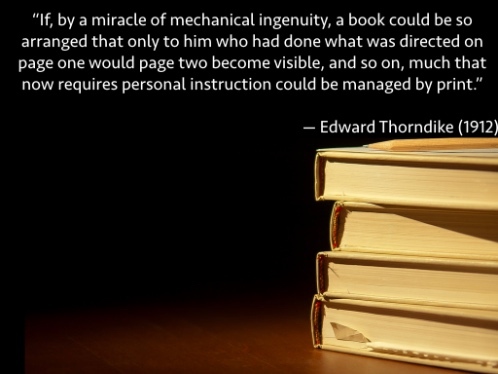 As such, Thorndike’s comment anticipates the development of the teaching machines of the 1920s and thereafter. You can draw a straight line, in fact, between Thorndike and behaviorist B. F. Skinner, the name mostly commonly associated with “teaching machines” and the person who coined the phrase “programmed instruction." Skinner devised the idea for the teaching machine after visiting his young daughter’s classroom and observing what he thought were the “inefficiencies” in it. Students all had to move at the same pace, he said, and when they completed assignments and quizzes, they did not receive immediate feedback and instead had to wait until the teacher had graded and returned the work — days later — to see how well they’d done. Skinner’s machine offered educational materials broken down into the smallest possible steps. To move through the materials, students had to correctly answer the questions presented by the machine. A correct answer would reveal the next question, and the student could move on. 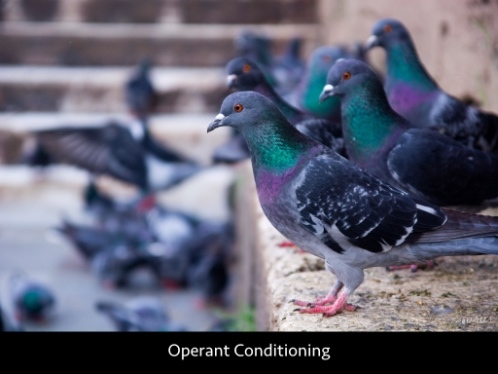 This, of course, fits with Skinner’s theories of behaviorism and his notions of operant conditioning. All teaching — with or without machines — was viewed by Skinner as reliant on a “contingency of reinforcement.” The problems with human teachers’ reinforcement, he argued, were severalfold. First, the reinforcement did not occur immediately; that is, as Skinner had observed in his daughter’s classroom, there was a delay between students completing assignments and quizzes and their work being corrected and returned. Second, much of the focus on behavior (as it is traditionally defined) in the classroom has to do with punishing students for bad behavior rather than rewarding them for good. So there we have it: the birth of the instructional technologist. Note the focus in that phrase on instruction and technology (not on, say, learning and technology.) Designing the machine. Designing the material. Despite the intervening decades, instructional technology is not so far removed from programmed instruction, and the profession needs to wrestle with that, I think. Programmed instruction reflects and reinforces — as I suggested earlier, hard-codes even — content as the center of learning, the center of certain theories of learning and of their associated classroom practices. Content is at the heart of many of the mechanisms we’ve spent the last hundred years or so building to aid education. Content continues to be at the heart of many new mechanisms as well. But I think new technologies and — let’s give recognition where recognition is due — many older learning theories have demonstrated that there are alternatives. Think back to my anecdote about the class discussions with my peers in the penitentiary. 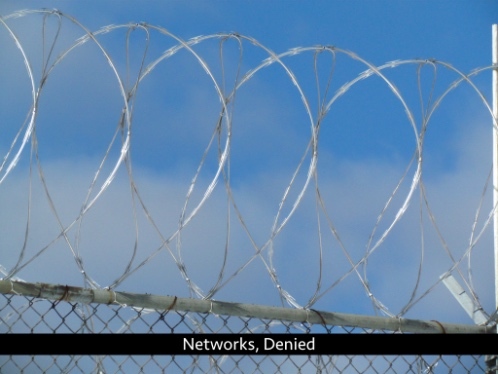 The network there was enabled by conference calls. Today, we’re more likely to point to the Internet, not the telephone, as the technology that enables networked communication. But I want to specifically talk about the Web, which is — or could be, at least — a significant shift away from programmed instruction. And the shift isn’t simply about a new technology for content delivery. It isn’t about giving Classroom A access to Digital Content B or connecting Classroom A with Classroom B so they can jointly listen to the same lecture. Despite the ease of distribution that comes with Internet technologies, these examples still position content in the center of the educational enterprise. We can’t act as though “access” to content is the pinnacle of what new technologies can afford us. We can’t act as though “digital distribution” of content is the pinnacle either. What’s interesting and important and (in my most hopeful moments I can even say) potentially transformative about the Web isn’t just that we are networked. It’s that the pages that we can load in our browsers can be read and can be written. They can be written in human language; and they can be scripted in computer language. The phrase “Web 2.0," coined circa 1999 — the read/write Web — feels more than a little passé in 2014, particularly as we see the corporate vultures who’ve swooped in to re-write what “social” looks like online and to encourage us to read and write in their information silos. But the readable, writable, programmable Web is an important development in education technology. Perhaps one of the most important. As such, we can’t just let that go. We can’t just surrender the Web to the technology industry, just as we shouldn't surrender ed-tech to programmed instruction. 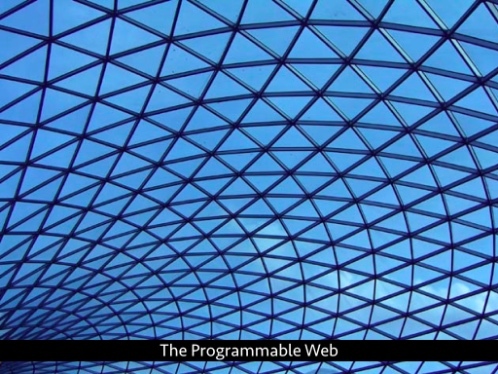 The readable, writable, programmable Web is so significant because, in part, it allows us to break from programmed instruction. That is, we needn’t all simply be on the receiving end of some computer-mediated instruction, some teacher-engineering. We can construct and create and connect for ourselves. And that means that — ideally — we can move beyond the technologies that deliver content more efficiently, more widely. It means too we can rethink “content” and “information” and “knowledge” — what it means to deliver or consume those things, alongside what it makes to build and control those things. 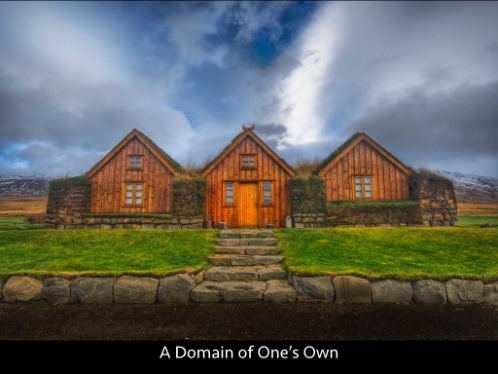 One of the most powerful things that you can do on the Web is to be a node in a network of learners, and to do so most fully and radically, I dare say, you must own your own domain. Supporting students in owning their own domain is one of the most important things we in education technology can do. We can frame this, at the very least, as giving them “skills" that will be useful in their personal and professional lives, but the implications are much broader. I typically point to the University of Mary Washington as an example of a school that gets this and that is leading the way for others. UWM gives each faculty and student their own domain — and I don’t mean simply webspace on the university’s servers. UWM helps everyone buy the domain of their choosing, and they host it for the duration that the student is enrolled. They offer a simple interface that helps with installing open source software like WordPress. And then when a student graduates, everything — all the content that a student has created, everything they’ve uploaded onto their site — can go with them, as UWM hands them the keys to their domain. It is theirs. Thanks to technologies like RSS — short for Rich Site Summary or Really Simple Syndication — one can weave together the output from these spaces, syndicating them into one place. While the content remains distributed, housed on individual blogs, feeds can pull copies into a centralized site. This is how the University of Mary Washington managed blog posts for many of its courses. Students blog on their own sites, but tag their posts with keywords associated with a particular course. An RSS feed then posts content with that keyword to a course website. Learning on the Web means that the intellectual relationship isn’t restricted to student and content. The relationship isn’t only among student, content, and instructor. The exchange isn’t about a student demonstrating to an instructor that content has been “successfully delivered” and processed. Learning on the Web opens that intellectual exchange up in new ways. Authority, expertise, participation, voice — these can be so different on the programmable web; not so with programmed instruction. The Domain of One’s Own initiative at University of Mary Washington purposefully invokes Virginia Woolf’s A Room of One’s Own: “A woman must have money, and a room of her own, if she is to write fiction.” That is, one needs a space — a safe space that one controls — in order to do be intellectually productive. Intellectual productivity on the Web looks a bit different, no doubt, but there is this notion, embedded in the Domain of One’s Own project, that it is important to have one’s own space in order to develop one’s ideas and one’s craft. It’s important that, as learners, we have control over our content and our data. We aren’t simply receptacles for content delivery mechanisms, as imaged by the machines of programmed instruction; and we aren’t simply the sources for learning outcomes and learning analytics — data that can be used to feed the new algorithms of today’s fancier teaching machines. Having one’s own domain means too that we have much more say over what we present to the world — in terms of our “public profile,” our professional portfolio, what have you. Control over the look and feel of the site. Control over the content. Control over what’s shared. Control — a bit more control, not total — over one’s data. If we are to resist “programmed instruction” — or at least do things differently in this so-called information age — we shouldn’t just talk about new education technologies that do the same old thing, but more efficiently. We have an amazing opportunity here. We need to recognize and reconcile that, for starters, in the content that programmed instruction — as with all instruction — delivers, there is a hidden curriculum nestled in there as well. Education — formal institutions of schooling — are very much about power, prestige, and control. 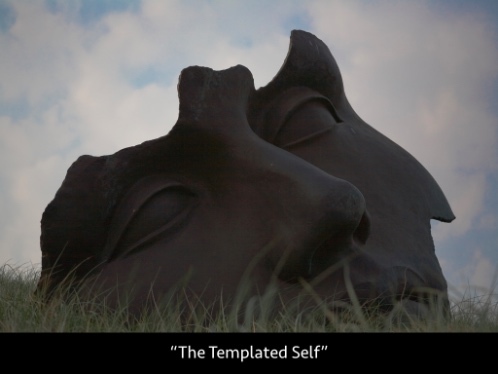 If we see learning as a process that develops the self, then control over that process and then control over the presentation of that self seems crucial. Again, this is why owning one’s own domain on the Web is so important. And it’s something that we need to scrutinize in education technology — in all technology, really. Programmed instruction doesn’t simply fix the content; it fixes the relationship between learner and instructor (whether machine or human). There is no reciprocity there, for starters. And there’s little opportunity to express oneself outside the pre-ordained — the programmed — design. Ed-tech works like this: you sign up for a service and you’re flagged as either “teacher” or “student” or “admin.” Depending on that role, you have different “privileges” — that’s an important word, because it doesn’t simply imply what you can and cannot do with the software. It’s a nod to political power, social power as well. While Amber’s examples here point to mostly “social” technologies, education technologies are also “participation architectures.” How do these technologies produce a digital representation of the learner-self? See I don’t want to overreach here and make an argument that the Web is some sort of technological or ed-tech utopia. Despite all the talk about “leveling the playing field” and disrupting old, powerful institutions, the Web replicates many pre-existing inequalities; it exacerbates others; it creates new ones. I think we have to work much harder to make the Web live up to the rhetoric of freedom and equality. That’s a political effort, not simply a technological one. Let me repeat that, because it has pretty significant implications for ed-tech, which is so often developed and implemented at the whims of political decisions — decisions made by politicians, administrators, decisions influenced by budgets, vendor pitches, and the latest Thomas Friedman New York Times op-ed. Decisions like ending Pell Grants for prisoners, for example. 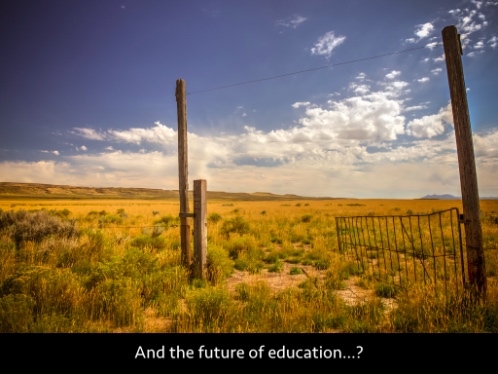 To transform education and education technology to make it "future-facing” means we do have to address what exactly we think education should look like now and in the future. Do we want programmed instruction? Do we want teaching machines? 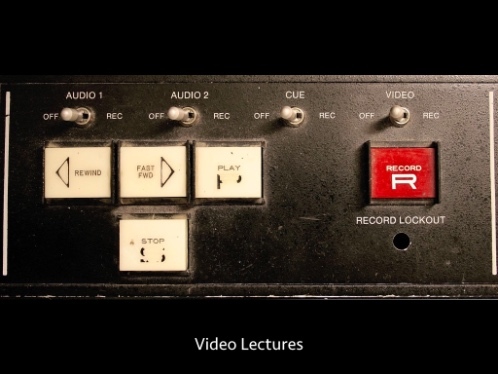 Do we want videotaped lectures? 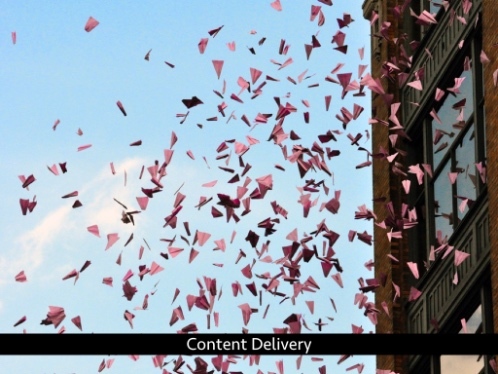 Do we want content delivery systems? Or do we want education that is more student-centered, more networked-focused. Are we ready to move beyond “content” and even beyond “competencies”? Can we address the ed-tech practices that look more and more like carceral education — surveillance, predictive policing, control? See, these are political questions and they are philosophical questions. I don’t think it’s quite as simple as a choice between programmed instruction or the programmable web. And instead of acting as though ed-tech is free of ideology, we need to recognize that it is very much enmeshed in it.